When the ability to capture data around a telephone call was first developed and made available by call tracking providers, marketers for the first time could accurately measure both click and call conversions to judge the success of their marketing campaigns. With this additional call measurement, marketers had the ability to optimise their campaigns knowing that they had all available information at hand to do so. Five or so years on, call tracking and the associated call analytics is becoming more sophisticated. Yes, the fundamentals of campaign optimisation will always be the backbone of the call tracking agenda – but as a call tracking provider, Delacon now offers more advanced ways of using the data to provide even greater insights. Through a series of technical integrations, Delacon’s system can send the captured call data into a variety of nominated sales and marketing software platforms. The features and functionality of these platforms now become all the more powerful with the inclusion of the call data. Customer relationship management tools (CRM), bid management software, third-party ad servers and affiliate marketing platforms are all enhanced with the addition of the data captured by Delacon’s software. This white paper will discuss how to gain even more intelligent insights regarding your customers’ behaviour by analysing call data in software that you may already be using. While Delacon’s reporting tool will give you essential call data such as the keywords and landing pages that led to a call, it is perhaps even more valuable to analyse the data using the functionality of Google Analytics. Google’s reporting platform operates in conjunction with Delacon’s call tracking solution by counting the call as a conversion. This call conversion is measured by creating a specific goal identified by a Delacon virtual page. Every time a call is made this page registers a “hit” and as such the goal is met. 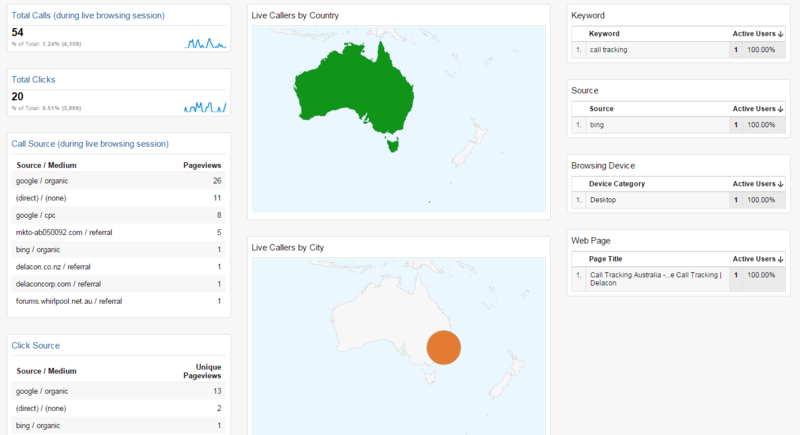 By accessing the virtual page you can see the volume of calls made over a selected time period. These secondary dimensions are offered by Google as part of their existing reporting tool. The migration to Universal Google Analytics has facilitated the ability to send custom dimensions into the platform. These custom dimensions can be any data set captured by a third party such as Delacon. Custom dimensions that Delacon can send into Google Analytics include the unique Call ID assigned to each caller, the Campaign/Company ID (CID) that’s associated to each call tracking number set and the survey information that’s collected by using the post-call survey feature. These custom dimensions can be analysed by selecting the desired custom dimension as a secondary dimension against the virtual page. Alternatively, the data can also be accessed through the Events section. In addition, the multi-channel funnel with the call conversion will show you how many times a prospect accessed your website and how they found the site each time before making a call. The reverse goal path with the call conversion will show you the journey the prospect took around your websites before making a call. 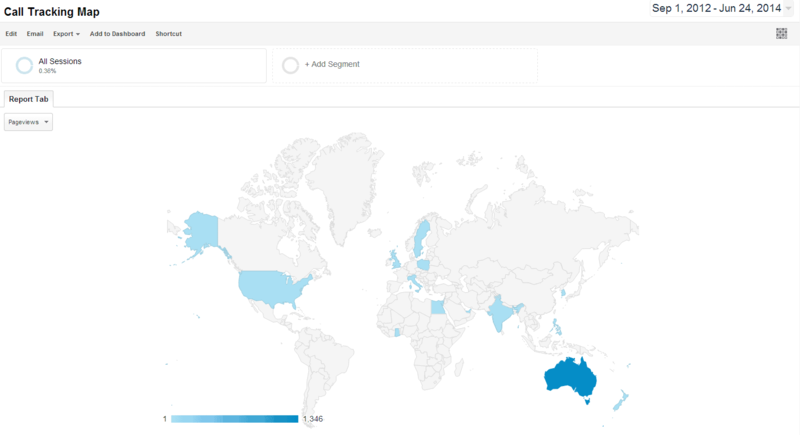 As a custom report, the geographical map layout will show you visually where your prospects are calling from both at a country and a city level. Also as a custom report, it’s possible to plot the call conversion and the click conversion on the same graph. By configuring a custom Google Analytics dashboard you’ll be able to see live real time call data as callers respond to your marketing campaigns. The data is populated the moment the call is connected. Through the use of widgets, you could display the callers by country and city, the keywords they used, the source of the search, the web page they called from and the browsing device. The same dashboard could also be configured with cumulative call data between a desired date range. You’ll be able to see the volume of calls and submission form clicks side-by-side and the sources that inspired both these conversion options. Within the AdWords platform, it’s important to configure your campaigns to include both click and call data to give you an accurate cost-per-conversion. However, you could take your use of AdWords to the next level by running remarketing campaigns that include callers. In the same way as remarketing to prospects who visited a dedicated page or pages on your website, so too could you remarket to prospects who triggered the Delacon virtual call page. A cleverly designed call-based remarketing campaign could be enough to push them from being a prospect to a customer especially given the fact the callers are generally closer to making a purchasing decision. With the inclusion of custom dimensions, you could become even more granular for your the call-based remarketing campaigns. Bid Management tools have made the job of agencies and internal marketing teams much easier. Managing a multitude of online campaigns is now much more efficient through the use of software provided by Marin, Kenshoo, Acquisio and Sizmek. By setting a desired algorithm, the system can automatically reconfigure the online bidding as prospects interact with your paid ads. Using the over-arching principle of call tracking, if you’re only sending online click data into the bid management platform then you’re missing a key metric and potentially optimising campaigns based on inaccurate data. With the inclusion of click and call data you’ll have a true representation of the results of the marketing campaigns. Overall you’ll be able to more effectively analyse your online campaign performance across all your channels to more accurately determine your return on investment. Kenshoo’s sophisticated algorithm will automatically re-evaluate successful campaigns and reallocate funds. The platform encourages users to define the most appropriate weighting for each conversion and to grant the algorithm permission to optimise each campaign based on your business objectives. Using the Attribution Model functionality you could add greater weight to call conversions as opposed to click conversions. In addition by using Kenshoo’s custom metrics you could define elements of the call that are important to your business. Therefore if call duration is an important factor when defining the interaction of leads with your call centre, you could set a custom metric that defines calls over a particular length and give a significant weighting to those calls. This can then feed back into the algorithm to optimise campaigns and keywords that generated those calls. The reporting tools of Kenshoo are designed to present both an overview of campaign performance and facilitate granular analysis. The call log offers a detailed description of each caller, while the path to conversion report will demonstrate the prospect’s journey prior to the conversion – whether that be a call or click. Delacon’s solution enhances Acquisio’s impressive reporting tools by adding phone calls as a key conversion component. You will now have a complete and accurate view of the performance of all your online marketing campaigns including paid ads on Google, Bing, Yahoo and social media platforms. By sending call data captured by Delacon’s call tracking solution into Marin Software you’ll have access to all campaign performance data in one platform. You’ll be able to more effectively analyse your online campaign performance across all channels to more accurately determine the return on investment. Using the reporting tools, you’ll be able to see click and call conversions side-by-side against campaign source and importantly against keywords. With this complete knowledge you can make fully informed decisions regarding the optimisation of the campaigns. With the inclusion of call data in Sizmek, you’ll be able to analyse all your online campaign performance and leverage greater insights into the customer journey. By creating custom tags in Sizmek to track the call as a conversion, you’ll be able to analyse call and online campaign data side-by-side. Within the Sizmek platform there are both pre-defined and customised reports. Depending on your requirements, you can analyse the call data in the report that’s most useful to you, your business or your client. Accessed through the Analytics platform, the Conversion Summary Report provides the results from individual ads and their placements. Together with served impressions, total clicks, total conversions and total conversions rate, you can also break down the conversions into web conversions and call conversions. This way you’ll be able to clearly identify the volume of calls generated from each marketing initiative. In a model that’s entirely based around the financial reward for affiliate websites promoting products and services of businesses, it’s only logical that both clicks and calls should be included in the reporting. With the inclusion of Delacon’s call tracking software, it’s now possible to accurately track the volume of calls generated directly from the affiliate website and the volume of calls from the business website after clicking through from the affiliate website. This way the affiliate can be compensated for all leads they generate and the marketing team can have a true representation of the campaign success. As an agency or advertiser, by capturing both web and call conversion data in PHG, you’ll be able to more effectively analyse the true representation of which affiliate marketing site is delivering the most leads. In addition to the call conversion from the affiliate site, you may also decide to include a link from the affiliate website to the client website. While it’s relatively easy to track the volume of traffic, what happens if the prospect decides to call from the client’s website? The source can be assigned to the affiliate website and the conversion as a phone call can be attributed to the client website. By sending call data into your CRM and/or marketing automation tool, you’ll have the ability to close that elusive loop and to accurately identify the call source for prospects regardless of when they become customers in the future. The original source that inspired the prospect to contact your organisation – will remain attached to the prospect’s record indefinitely. This allows you to identify advertising sources that, not just result in conversions, but the source that delivers customers to the business. In addition, by making available the call data to your sales team in real time, they will have the ability to use this data to guide the conversation to a potentially more successful outcome. Following the same principle as the Salesforce “web to lead” functionality for online leads, if your Salesforce instance is integrated with Delacon’s call tracking solution a new lead will automatically be created in Salesforce and populated with call data when the lead calls your organisation. Delacon calls this the “call to lead” functionality. Where the phone number of a caller is already associated with an account or contact, the system will create a new activity attached to the relevant account or contact object. With Delacon’s live integration, the data is available in real time – so the sales team can use this information to influence their conversation with the lead. In essence Delacon’s solution provides invaluable data to the sales team of what the lead has done prior to the call. The fields that will be populated include the call start time, device used, keywords used, number dialled, referral URL, search engine used and the landing page. To access the live Salesforce lead record of the caller while they are on the phone, there are two identifiers – the telephone number or a unique code associated with the phone call that’s generated by Delacon’s system. With a VoIP phone connection, Delacon can display the caller’s phone number or the code on the operator’s telephone screen. Under a PSTN system, Delacon can display the caller’s phone number. Delacon can also set up a whisper message prior to the call connection that will tell the operator the caller’s phone number or the code. The operator can enter the identifier into the search field of Salesforce to access the newly created lead. By mapping the call tracking data to the Account object, you’ll be able to keep an accurate history of the entire customer’s journey; linking the initial marketing initiative to the customer – even if it takes months or years to convert them from a prospect to customer. You’ll be able to streamline your marketing operations by either syncing call data fields between your CRM and your marketing automation platform or by having a direct Delacon integration with your marketing automation tool. To identify the volume of calls from an email campaign, you can display a dedicated call tracking number on that campaign or email. In that way, Delacon’s system can accurately calculate all call conversions inspired by the campaign. In addition to calls from the email, the eDM may contain a link through to your website. Through a clever use of UTM codes and by using Delacon’s standard call tracking solution on your website, you’ll be able to accurately identify all prospects that clicked through from the eDM and then made a call. This advertising source data can be saved to either the CRM or Marketing Automation platform – so wherever you do your reporting, you’ll always be able to track the results of the campaign by including all forms of conversions. As gaining a customers attention becomes even more challenging in today’s competitive environment, the need for data-driven accurate marketing becomes even more important. With the inclusion of call data, you’ll be able to accurately track all conversions inspired by your marketing campaigns. And now through Delacon’s technical integrations with third-party software platforms, you’ll be able to make even more intelligent decisions regarding your marketing spend.